I’d been to the Broughton Deli way back in 2011 for a quick takeaway, but hadn’t had a chance to visit since then. On the recommendation of the chap who does our app, I headed there for a sit-in lunch. 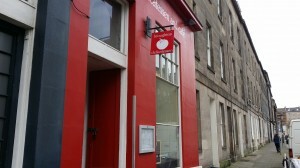 I was joined today by Danielle from Edinburgh Foody. Danielle is soon off to pursue her love of baking on a six month trip to France. It was good to catch up with her before she headed off. Their menu is a good blend of brunch dishes and lunchtime options. It’s a varied selection with things like ramen noodle soup sitting alongside salads, stews and sharing platters. 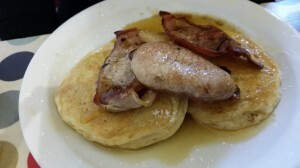 Danielle opted to try their pancakes and bacon, while I thought I’d give their burger a go. We ordered at the counter then took a seat in their charmingly bright and airy back room. Dishes were soon with us looking quite impressive. My burger was very substantial and Danielle’s pancakes looked similarly hearty. 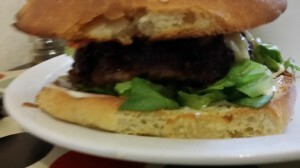 My burger, a blend of pork and beef, was outstandingly good with mountains of flavour and excellent moisture. The Isle of Mull cheddar topping was delicious and the sesame brioche bun was nicely toasted. It was a memorably good dish and right up there with the best burgers I’ve tasted. So overall, as my previous review suggested the Broughton Deli is definitely more of a sit-in place. While their takeaway fare is very good, the dishes we sampled today were a notch better than that. With a lovely atmosphere and attentive service, this is an excellent spot for a relaxing brunch or lunchtime stop.